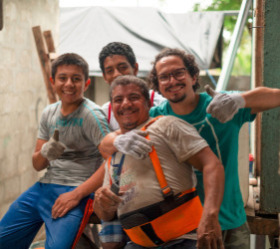 Meet the Reyes-León family, a hard-working and loving family from Chongón, Ecuador. 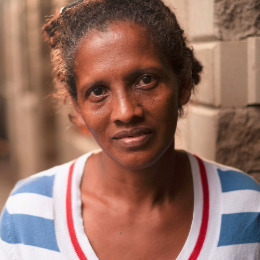 Melba is the mother of the family and head of household, as her husband abandoned her and the children after the birth of their youngest child, Jeremias, who was born with Down syndrome. Melba and her other children love Jeremias with a perfect, unwavering love which the cheery young boy happily reciprocates. Caring for a large family can be very difficult for Melba, especially considering the extra attention and care her youngest son needs. 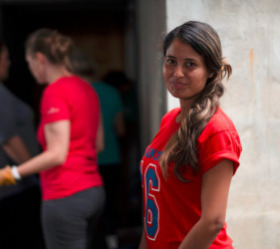 She works extremely hard to provide for her family, ironing clothes and cleaning homes in hopes of bringing home $10 per day on the weekends, but this is only an option when work is available. The Reyes-León family survives on anywhere between $100 and $200 per month (between $3.25 and $6.50 a day). In addition to paying to put food on the table, Melba believes that her children’s education is paramount to success in life, so she also works diligently to put her school-aged children, ages 9–16, through school at the Young Living Academy. Melba’s family was living in a two-bedroom, one-bathroom apartment due to their very limited resources. Understanding the family’s daily struggle, we knew that we could help improve their quality of life. 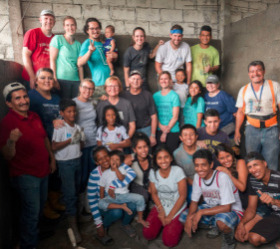 With a group of amazing members, the Foundation team sprung to work during the February 2018 Ecuador Service Trip, successfully building out their home to include three new bedrooms, two new bathrooms, and a brick fence around their home. The Reyes-León family is so appreciative, and Melba is overjoyed knowing that finally she will have the ability to provide her children with shelter, safety, and space for years to come. And I thank all of you. I thank you wholeheartedly. The Foundation has made many things possible for my family and for other families that I have seen. The experience of working alongside this family has been incredible, and we are immensely thankful for the ability to make a difference in the lives of those in need, such as the Reyes-León family, all thanks to the generosity of our wonderful donors. If you would like to provide a hand up for a person or family in need, we invite you to continue rounding up your Young Living orders and click the button below to contribute today! Sign up to get inspiring stories and updates delivered to your inbox.